These have one position for use (up) and a stowed position (down). They can be removed and are interchangeable side to side. then, press the lug A . 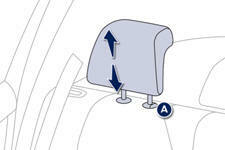 Never drive with the head restraints removed; they must be in place and correctly adjusted.